Augusta, Georgia is home to numerous scenic roads and trails that provide a great experience for everyone. Our city hosts the Augusta 70.2 Ironman, is home to many disciplines of cycling national championships, boasts a vibrant and commuter friendly downtown, and connects to several trail systems, including the Augusta Canal path and singletrack. Mountain bikers seeking more of a challenge enjoy making a quick drive out to the FATS Trail System, where they will find a total of 37 miles of some of the best single and doubletrack in the region. Outspokin' Augusta was founded in 1977 when I was 17 years old. My brother Vince and I started commuting on the 10 speed bicycles that I would work in the garage of my parent’s house in South Augusta. I enjoyed working on bicycles and Vince enjoyed riding. He came up with the idea of riding his bicycle from Augusta, GA to Huntingdon, PA - with some camping, sleeping over with friends, and a hotel night or two along the way. Even 30 years later I haven't come close to that kind of ride. As a college freshman I met Richard Thompson, owner of Breakaway Cylery, while riding in Augusta. After some talking, Richard sold me the name Breakaway Cyclery along with a hand full of new bikes and two handfuls of old bikes and parts. At the time I would go to Augusta College in the morning before opening the shop, located in Evans, GA, from 12-7 P.M.. 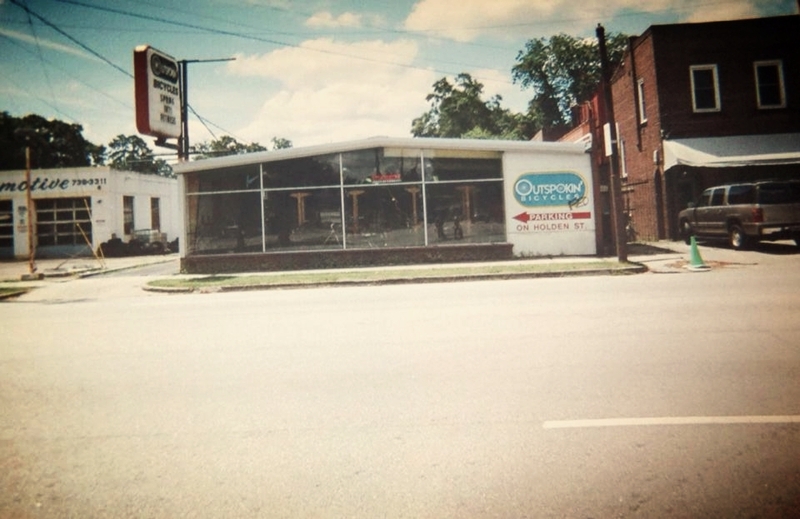 In 1979, Evans, GA was no place to be for business, and I quickly saw an opportunity in moving the shop to Lumpkin Road in South Augusta, where the shop developed a strong foundation. Meanwhile, I continued to commute to Augusta College. Here I met a fellow student, German Chavarria, who began working with me at the shop. We shared the passion of working with, selling, and riding bicycles, and as life moved on we both finished our education and expanded the operation to a second store in downtown Augusta. In the coming years I opened or took on additional stores in Aiken, SC, Macon, GA, Columbia, SC, and Augusta, GA. Chris Hardwick's Columbia shop was one of the strongest professional cycling shops in the Southeast, and I felt privilidged to take responsibility for it. As the businesses grew in the early 1990s, it became important to redefine the shop's identity, changing our name from Breakaway Cyclery to Outspokin' Bicycles. As the economy began to transition in the early 2000s we decided that we could best serve the riding community by bringing all of our inventory and personnel under the one roof of the original downtown Augusta shop. This move allowed us to better serve our original passion for cycling, our desire to help customers regardless of race or economic status, and our ability to build local community through the fun of riding. We have been very fortunate to work with some great people in this area and have created lifelong friendships with many. I have taken pride in owning a very professional specialty business and thank every employee that has pushed me to continue to make it better. So far it has been a great ride. thanks for voting us augusta’s best! "I have been buying bikes from Brett for over 30 yrs. Consistently great sales support and service after the sale. Brett and german are the best! " — Jim W.
"Knowledgeable staff, good products. One of the employees Brett went above and beyond to help me with the whole process. I left the shop ready to ride my bike. I have ridden twice so far on my Trek and I am absolutely happy!" — Muhaned Y.